“WHEN I had to sing in a recent picture,” says Carole Lombard, “I considered giving up smoking. But my voice teacher said I needn’t if I’d select a light smokeâ€”Luckies. 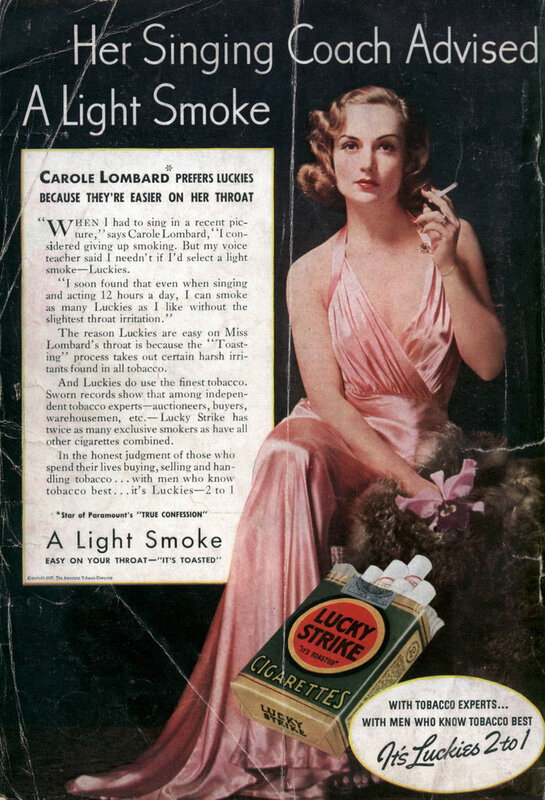 The reason Luckies are easy on Miss Lombard’s throat is because the Toasting” process takes out certain harsh irritants found in all tobacco. And Luckies do use the finest tobacco. Sworn records show that among independent tobacco expertsâ€”auctioneers, buyers, warehousemen, etc.â€” Lucky Strike has twice as many exclusive smokers as have all other cigarettes combined.